I love tools. I like to feel that I always have the right one for the job and I treasure the set that I've built up over the years. But starting out in electronics does not have to be expensive. You can start with just a few inexpensive tools and build up from there. 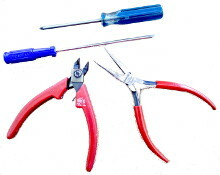 The essential tools that I believe that you must have for diy electronics projects are a pair of wire cutters and a small screwdriver. A pair of long nose pliers will come in very handy also. These tools can be bought very cheaply. bare minimum diy electronics tool kit. More tools can make life easier for you sometimes but when it comes to handling components and building electronic breadboard circuits you can generally get by with this skeleton tool kit. I know that I just said that all you need to start with are 4 inexpensive tools and I stand by that. I am going to suggest that you might want to start with a nice neat set of tools which will give you a far more comprehensive range of tools for not much more money than buying the skeleton kit items separately. You may end up with a few tools that you will never use but you never know when they might come in handy. This tool kit will be useful around the house as well as for building electronics circuits and it comes in a handy case to keep them all together. Get yourself kitted out with tools from the list below today and you will be ready to start building electronic circuits. This set contains all the essential tools that you are going to need when you start building electronic circuits. It is a kit intended for computer repair technicians but it should serve your purpose well. I like this tool kit because it has a very useful little extra in the form of an anti-static wrist band. It's purpose is to ensure that your body does not carry an electrostatic charge that may cause damage to your components when you handle them. The wrist band needs to be clipped to an earth point like a radiator or a large metal object to let the charge leak away. You should wear one of these whenever you do any electronics work just as a precaution. A small regular blade screwdriver is an absolutely essential tool. It's hard to imagine ever getting the job done without one of these on hand. Small tools like this are also very easy to mislay and it can be very frustrating if it isn't there when you need it. I generally keep 3 or 4 of these on the go in different places so that I can always find one when I want it. A small cross head screwdriver comes in these sets too. A means of cutting fine wire and component leads is an essential tool requirement and you might want to consider purchasing a pair of side cutters even if you purchase the kit I mentioned above. I personally prefer side cutters to the kind of wire cutters that come in the set and it's worth getting a good pair. You don't need both but this is a nice to have item. You will find these invaluable for everything from picking up small screws to manipulating component leads into breadboards and circuit boards. That completes the essential tool list so I'm just going to list a few small additional tools that I find useful in my workshop. I occasionally find one of these very useful. I use it mainly when soldering and trying to hold a soldering iron, a circuit board and solder all at the same time. If you don't plan on doing any soldering just yet then may not need this yet but bear it in mind for the future.